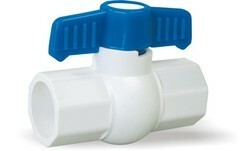 Aquachem Industries Pvt.Ltd new designs of uPVC ball valves with hexagonal shape and long handles. Compared to conventional shape these newly designed and patented solid ball valves are easy to handle and mounting thereby reducing plumbing time. Smooth inner wall, Reducing Pressure, Loss and increasing flow speed Light weight (approximately one eight of metal pipes), easy to handle and transport. Blessed with a team of highly experienced professionals, we are engaged in offering premium quality UPVC Solid Ball Valve. Offered valve is extensively used in several industries for regulating the stream of gases or liquids. 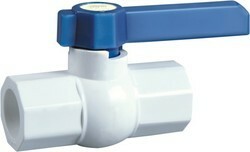 The offered valve is made available in different requirements as per the specific needs of clients. Aquachem Industries Pvt.Ltd new designs of UPVC Long Handle Ball Valve with hexagonal shape and long handles. Compared to conventional shape these newly designed and patented solid ball valves are easy to handle and mounting thereby reducing plumbing time.